Walter Garfield Madison was one of the first African American students to graduate from Iowa State and was the first to receive a degree in mechanical engineering when he graduated in 1914. Madison was born and raised in Manor, Texas, just northeast of Austin. He graduated with a diploma in steam engineering from Alabama’s Tuskegee Institute in 1906. Madison filed a patent for a “flying machine” in 1910 and in 1912 he was granted the patent. Perhaps influenced by George Washington Carver, an Iowa State alum on the faculty at Tuskegee, Madison moved to Ames so he could continue his studies at Iowa State College (as it was called at that time). Madison’s time at Iowa State briefly overlapped with Henry Agard Wallace, who would go on to serve as agriculture secretary, commerce secretary, and vice president under Franklin D. Roosevelt. As a student at Iowa State, Madison was a member of the Forum literary society and also played first clarinet in the Iowa State College Military Band. In the fall of 1912 Madison lived in “The Maples”, which was the home of Edgar Stanton who was then dean of the junior college and part of ME’s first graduating class in 1872. 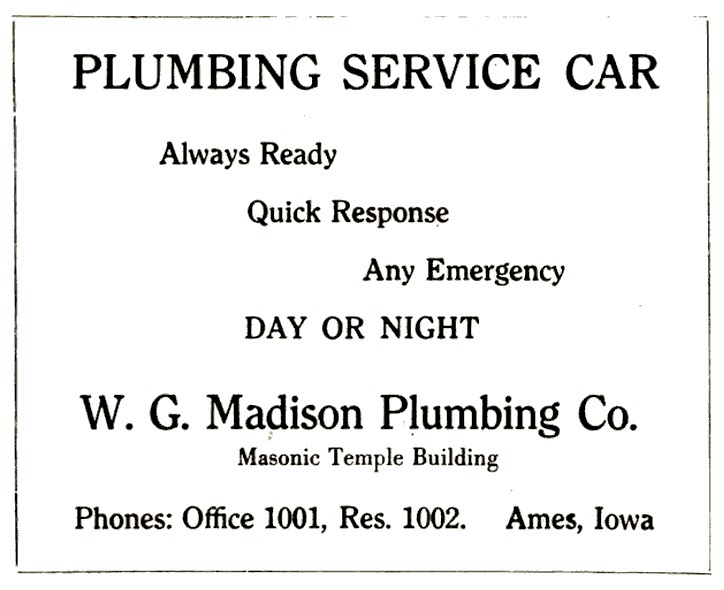 After graduating with his ME degree in 1914, Madison stuck around Ames for the next two and half decades working as a heating and plumbing contractor. His business was initially in the Masonic Building (southwest corner of Douglas Avenue and 5th Street) but later moved to the Olsan Building (southwest corner of Main Street and Burnett Avenue). During his time in Ames he helped in the construction of sections of the city’s sewer system as part of a major public works project in 1916 and 1917. He is also credited with writing part of the first Iowa Plumbing Code. 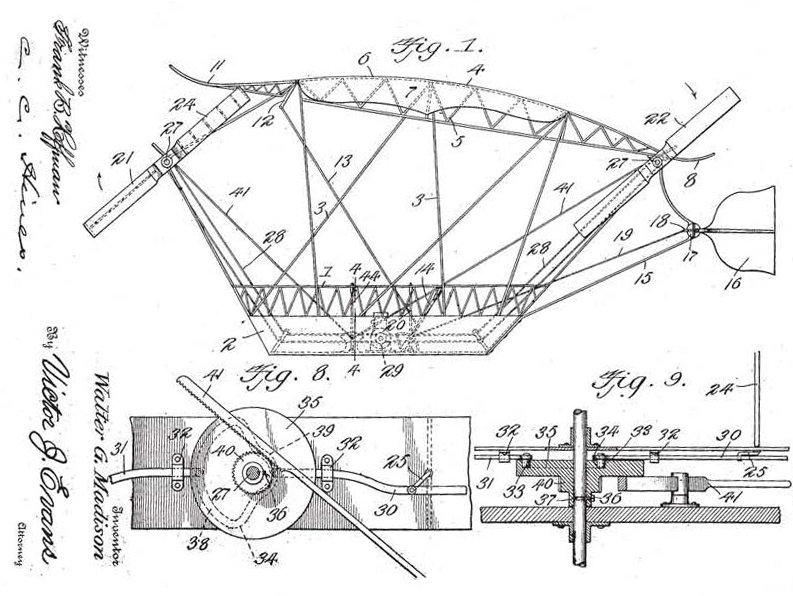 A blueprint for Madison’s “Flying Machine.” Image via United States Patent Office. Despite these contributions he made to the community, Madison was subjected to unfair treatment because of his race when he and a client were denied service at a downtown Ames restaurant on Feb. 1, 1922. Madison filed a lawsuit in the Story County District Court against the restaurant’s owner for the humiliation and mental anguish he experienced because of being denied service. The case was settled out of court in January 1923 and Madison was awarded $100. State law at the time forbade restaurants, hotels, and other establishments open to the public to deny service based on race or color. In 1917, Madison participated in a reception and banquet “in honor of the colored officers training camps at Fort Des Moines.” ME alum Edgar Stanton also attended the event. Then during World War II the Army purchased Madison’s patent for “a radiator bracket designed to support radiators from walls rather than floors” which were installed in various Army camps. Madison’s son Horace, a Private First Class, was killed in action in Italy in 1945 while serving in World War II. Just three years later Madison’s son Archie, a First Lieutenant in the Army engineers, died while serving in Korea. Archie studied mechanical engineering at Iowa State and served in the Pacific theater during World War II. An advert for Madison’s Ames business published in the 1920 edition of The Ames Forrester. 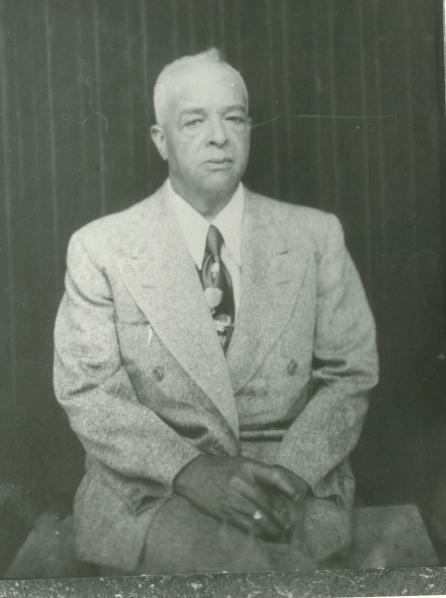 Walter Madison left Ames in 1938 to serve as chief engineer at Fisk University, a historically black university in Memphis, Tenn. In this position he was in “charge of all engineering aspects of the operation of the university’s plant, which includes 40 buildings.” From 1942 to 1944 he served as a professor of mechanical engineering at Howard University, a historically black university in Washington D.C.
Walter Madison Sr. passed away at Freedmen’s Hospital on the Howard University campus on Feb. 28, 1964. He was 76. Madison was survived by two of his sons who both also pursued careers in engineering. His oldest, Walter Jr., studied general engineering at Iowa State in the late 1930s, worked as a mechanical engineer in Washington D.C., and passed away in 1985. Ira, his youngest, was a civil engineer in Los Angeles and passed away in 2000. Madison’s senior photo in the 1914 edition of The Bomb yearbook. Thank you so much for this article about my grandfather! What a great Black History tribute to him. My father was his first child, Walter Jr. My five siblings and I have fond memories of him while growing up in Washington DC. Is there anyway I can get a copy of the article? I️ am the granddaughter of Walter Madison and daughter of Archie Madison. Thank you for recognizing him during Black History Month. This a very great article! Walter G. Madison is my Great Grandfather. Is there a way to get an official copy of this article? I would like to share it with other family members. Five of his grandchildren are still living, one of them is my mother. Please be in touch. Thanks for the kind words and for reading the article. I enjoyed researching and learning about the life of your great grandfather so I’m glad you enjoyed reading about it. As far as an original article, this online version is technically the original. I plan to include this story in the spring issue of our alumni magazine (http://www.me.iastate.edu/news-events/dimensions-newletter/). I’m not sure if we’ll do a printed copy of the magazine but I’d be happy to send you a digital copy when I publish it around May. If you would me to send you a digital copy, please send me your email address. Feel free to email it to me (nrfetty[at]iastate.edu) if you don’t want to post it here. Also I’d be happy to send you PDFs of some of the primary source materials that I used for research but didn’t include in my story such as the article about Walter’s discrimination lawsuit against the Ames restaurant as well as his obituary. Thanks for the kind words and for reading the article. I enjoyed researching and learning about the life of your grandfather so I’m glad you enjoyed reading about it. As far as an original article, this online version is technically the original. I plan to include this story in the spring issue of our alumni magazine (http://www.me.iastate.edu/news-events/dimensions-newletter/). I’m not sure if we’ll do a printed copy of the magazine but I’d be happy to send you a digital copy when I publish it around May. If you would like me to send you a digital copy, please send me your email address. Feel free to email it to me (nrfetty[at]iastate.edu) if you don’t want to post it here. Thanks, Gail! Glad you enjoyed reading this. The Iowa State University ME department is honored to have Walter as an alumnus of our program. Thanks for reading. I enjoyed learning about your grandfather through my research and I’m happy that others have enjoyed reading about him too. Walter’s great granddaughter Gina reached out to me and I sent her some documents/primary source material that I wasn’t able to include in my article. I’d happy happy to share those with you if you’re interested. Please send me an email (nrfetty[at]iastate[dot]edu) if you’re interested and I’ll send the PDFs your way. Thanks again for reading the article!